Flickering, crackling, and dimming lights are the stuff of horror movies and normally signal danger, whether supernatural or electrical. Everybody knows that spirits from the Upside Down and other dimensions communicate with us through electrical circuits. But, before you assume a poltergeist, here are some reasons why you may be experiencing strange electrical disturbances at home. 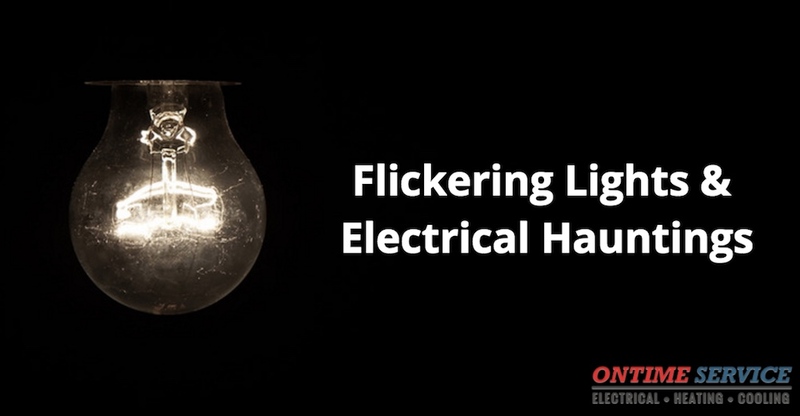 Flickering lights in particular are indicative of a dangerous electrical issue, such as a loose circuit connection, overheated wiring, splices coming apart, a fried fixture, a failing breaker switch, and an overloaded circuit. Sometimes electrical wires and connections get loosened inside switches and outlets. As wires age and get old and damaged, there is an increased risk for you and your home. The electrical contact points can lead to conductivity and intermittent dimming issues. The same thing can happen in your switches and outlets, where internal arcing can create electrical hazards. The frayed or damaged wiring inside the electrical housing can lead to both electrical dimming and flickering. If you suspect any wiring issues inside your electrical housing (such as circuit breaker boxes, outlets, or switches), call an electrician right away to conduct a full safety inspection. Frayed and damaged wiring can create a dangerous arcing situation. If you smell rotten egg, sulfur, or any other odd smells around electrical equipment, it’s important to get this addressed as soon as possible. These are all signs of a serious electrical safety hazard and should be addressed immediately. If you see burn marks or discoloration on any of your electrical switches, outlets, or breakers, don’t use the electrical system at all and contact your electrician for emergency service. Sometimes the problem exists outside the home, not inside. The power that enters your home trough aboveground or underground wires originates from a power grid facility. Whenever there is increased electrical demand in your area, there is a chance that “brown-out” conditions can lead to dimming and flickering in the home. This increased electrical demand during certain times of the day can increase your electrical bill without you even knowing it. In order to make sure you aren’t contributing to the city-wide power demand and to save money, it’s recommended that you run your high energy-consuming appliances during non-peak hours. Click here for the times of day when the electrical demand and prices are lowest in Alabama. Sometimes electrical ballasts are causing the issue with your flickering and/or dimming lights. The electrical ballast regulates the flow of electricity to a light fixture. If you ballast wasn’t installed properly or if it has aged considerably, the effects may include lights that are too bright, or lights that dim, buzz, and flicker frequently. Older homes have a lot of electrical problems that can be traced back to their aluminum wiring. Usually aluminum wiring is only found in homes that were built before 1970. Modern homes have safer and more efficient wiring. Aluminum wiring is notorious in the electrical industry because it is prone to thermal expansion, loosening at splices, switches and outlets. If you have aluminum wiring in your home, it is highly recommended that replace the wiring and conduct a full electrical inspection, making sure that all connections are checked. If your lights start to flicker whenever you turn on the blender or another appliance, this could be a sign that you are getting close to overloading the circuit. The electrical circuits in your home are typically set at 120 volts and can only power devices up to that amount. This is why you should install dedicated circuits for large appliances, such as HVAC systems. When you add more and more power demands to your circuit, you will begin to see lights start to dim and flicker. It will come to a point when you overload the circuit and the breaker trips. I you are experiencing flickering or dimming lights when you turn on an electrical device, then you should consider turning something off and moving it ao a different circuit. If you frequently experience lights flickering and then going out, you probably need to increase your electrical load potential. This can be done by calling an electrician to install a new electrical circuit. Older homes often need to retrofitted to account for the increased demands of a a modern family. With all our phones, computers, heating, cooling, and entertainment systems, it’s no wonder that your circuits are crying out for help. Click here for more information on overloading circuits and how to prevent them. Lights with dimmers are great, but lights that dim on their own—not so great. When bulbs and light fixtures dim, it could be the effect of aging. When a light bulb nears the end of its life, you can expect some dimming to occur. Check to see if the flickering bulbs are screwed in properly. Another problem that you may have with your light bulb is that someone put in a higher-wattage bulb that is causing overheating and wires and splices that are not working properly. To see if the light bulb is the problem, replace it with the recommended wattage bulb to make sure you aren’t “overlamping” it. If you were able to solve your flickering and dimming lights with the solutions above, great, but it’s probably also a good idea to schedule a professional safety inspection from a qualified electrician. You can usually find the date of your home’s last electrical inspection by taking a look at the inside of your circuit breaker panel. 10-40 years ago, inspection is advisable. Less than 10 years ago, inspection should not be needed unless electrical warning signs are present. Over Rated Panel – electrical panel contains fuses or circuit breakers rated at higher current than their capacity (sometimes called oversampled or overfused). Dim/Flickering Lights – lights flicker and dim, and/or the size of your television picture shrinks often. Electrical Shocks, Sparking, or Signs of Burning – any signs of electrical sparks, shocks, or signs of overheating. Sizzles/Buzzes – unusual sounds from the electrical system. Overheating – if you feel heat from any of your outlets or switches, there is a chance that wires are overheating inside. Turn off power at the break box and call an electrician. Permanently Installed Extension Cords – used to extend the home wiring system for a long period instead of being use temporarily to connect some appliance with a cord too short to reach the receptacle outlet. Damaged Insulation – cut, cracked, broken, or otherwise compromised insulation. Frequently Tripping Breakers – this is a sign that you are overloading your circuits and require an increase in power. Compromised Insulation – any cracks, tears, or other damage to you the insulation around wires and other electrical equipment. Rotten Egg, Fish, or Sulfuric Smell Near Outlets – you are probably smelling a dangerous arcing situation that is burning plastic housing components. If any electrical problems are found in the home, have the defects fixed immediately. Install smoke and CO detectors throughout the home to alert people the CO and smoke before it’s too late. Test smoke alarms, CO detectors, AFCI and GFCI outlets every 30 days. Make sure you an emergency evacuation plan and that you have practiced it with your family. If you have a Federal Pacific or Zinsco electrical panel, call an electrician immediately to have it replaced. These service panels are notorious fire hazards. Electrical arcing can happen along any point of the electrical service equipment. Never attempt to fix an arcing situation by yourself. Watch our Electrical Safety Videos for more tips on keeping your home and family safe. Our experienced team of electricians is fully trained to handle any electrical system.